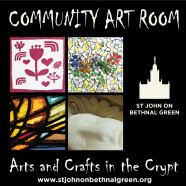 We are pleased to welcome artists from the Community Art Room here at St John’s to the Belfry. They will be showcasing works created in the classes using Mosaic, Stone Carving and Stained Glass inspired by found objects and rediscovered ideas. Artistic inspiration comes in many forms – it could be an old photograph or a picture in a book that has not been opened for years; a memory recalled by a piece of music or a fragment of ceramic found on the shores of the Thames. Join us for a special opening night on Thursday 4 April from 6pm to 9pm. Visit the Community Art Room page on this site for more information about the regular classes.